The Department of Dining Services, the Office of Environmental Policy, and the Alumni Association sponsored a water bottle that was handed out for free to first year students. Hydration Stations, also known as water bottle refill stations, are located in many campus buildings thanks to UConn Facility Operations. There are currently about 25 sites on campus, and the university is looking to install about 25 more within the next fiscal year. Many residence halls are retrofitted with these water bottle refill stations, making it easy for students to quickly fill up their reusable bottles on the go. There are also two stations in the Student Union, as well as one in the UConn Recreation Center. With fresh, cold water right at your fingertips, you are more likely to consume a larger amount of water, keeping yourself healthy and alert! Hydration Stations also have a profound impact on the environment. They are equipped with a digital screen that reads exactly how many times it has been used, signifying how many plastic bottles it has replaced. The process to produce plastic bottles requires the use of finite resources such as water and oil, and gives off tons of greenhouse gases. For every liter of water sold, it takes two liters to produce. It is much more sustainable to reduce consumption, rather than recycle what you have bought. In case you need more hydration motivation, tap water is under much stricter quality standards than those of bottled water. The UConn drinking water is frequently tested for 15 contaminants in addition to meeting the federal Environmental Protection Agency and CT Department of Public Health requirements. On the other hand, the bottled water restrictions from the Food and Drug Administration are much less stringent and are neither well enforced nor applied to every company. 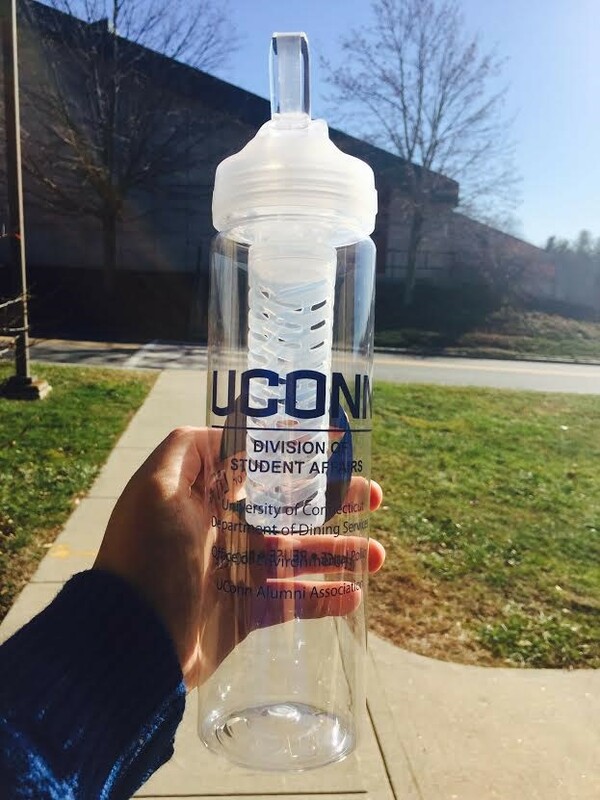 The decision to refill your water bottle every day at the UConn Hydration Stations can be made with true confidence! Next time you are out and about around campus, keep an eye out for your free, clean, and convenient water. Thirsty for more? Encourage your friends to use these stations instead of spending money and resources on single-use plastic water bottles. This past April, the Office of Environmental Policy reported that 75% of our student body and 25.88% of our employees utilize sustainable commuting methods, including walking, bicycling, taking a bus, or carpooling. I believe that we can do better. If y ou drive to school or work every day in a single occupancy conventional motor vehicle (meaning that you do not carpool), there are strategies you can use to green your commute. 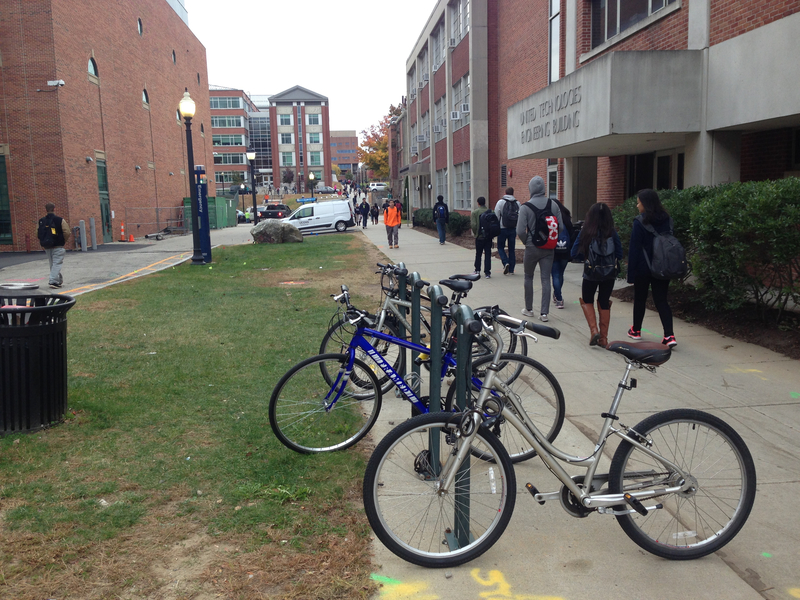 The University of Connecticut offers a variety of programs to incentivize environmentally friendly transportation. For students, the best way to get to class without driving is to live on campus or near enough that you can walk. For off-campus students, consider carpooling with your roommates or with other students who live nearby. If you do carpool, groups of 2 to 4 students can share a single parking permit, which results in major savings for the students involved. Also, each semester the carpooler’s parking pass comes with 2 complimentary day parking passes per student, on days when carpooling may not be convenient. Driving a clean vehicle, like a hybrid car or and electric car, is a great way to reduce your transportation carbon footprint. 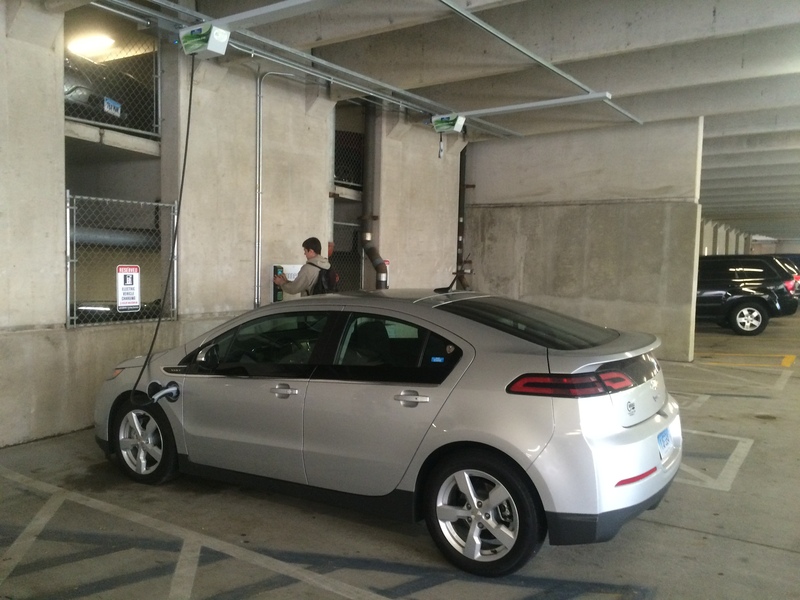 We currently have electric vehicle charging stations in North and South parking garages, which are free for the first five years after installation in order to incentivize electric vehicle use on campus. The bus is among the most popular sustainable transportation methods around campus. There are buses that run to Depot Campus, between Willimantic and Storrs, and around the Storrs campus several times per day and completely free of charge (actually, you pay for it as part of your fees). There are several bus routes on campus, labeled by color, including Green, Yellow, Orange, Blue and Purple. The buses can take you to almost any corner of our expansive campus, including Storrs Center, Hilltop, and Horsebarn Hill. I hope that these options have informed you of something you were not previously aware of, and that this information can help us on our quest to become a greener university. Do your part, and try one of the options listed above! Taking UConn Cycle Share for a Spin! My name is Matt and I work at the Office of Environmental Policy as a sustainability intern. I was so excited when I heard about UConn Recreation’s new bicycle sharing program, UConn Cycle Share, that I decided to take one of their bikes for a spin! Although a semester long rental is available, I opted to take advantage of their week long rental that runs from Thursday morning to Wednesday night the following week. Initially, I got off to a rocky start as I missed the 5pm Wednesday online reservation deadline that is handled through UConn’s RecRegistration website. Fortunately, a great feature of the program is that even if you fail to register in time, it’s still possible to rent a bike. In my case, I could see on the website that there were still bikes available, so I decided to stop by the UConn Adventure Center on Thursday afternoon to see if this was true. To my delight, there were still bikes available, and I soon found myself walking out of the Student Union with bike, lock, and helmet in hand, ready to tackle the UConn campus. I experienced the benefits of a bike immediately. After picking up my bike, I had only half an hour before my next class, and I still hadn’t eaten lunch. Normally, there would be no way for me to walk to a dining hall, eat, and walk all the way to my class in such a short time frame. But with the bike, the situation was different. I had speed on my side. I quickly rode to McMahon dining hall, but painfully discovered that they were closed. I then hopped right back on my bike and headed to South dining hall. I was able to eat and pedal all the way across campus to one of the engineering buildings just in time for the start of my class. Throughout the week, there were many other advantages of the bike. 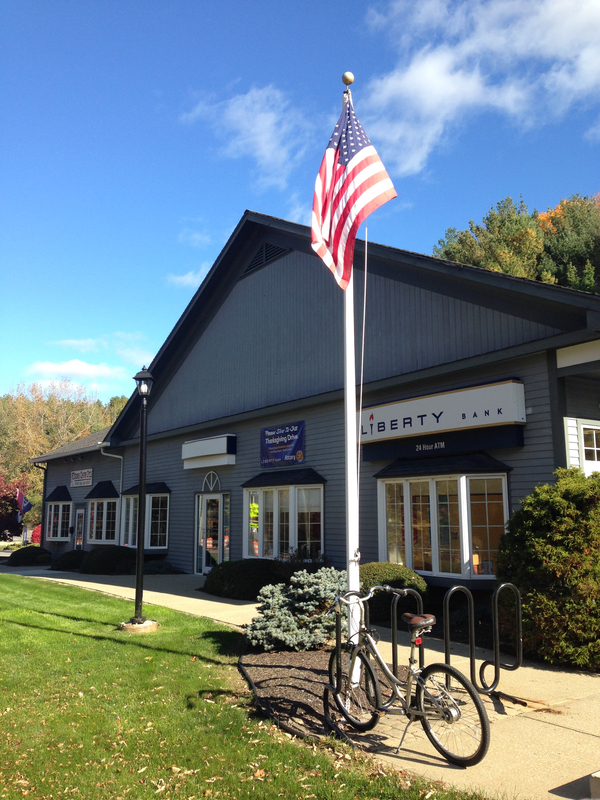 One day I had to go all the way to Liberty Bank, which is located on Route 195 past Storrs Center. I have had to do this before and it takes me a solid hour just to walk to and from the bank; however, with the bike, I reduced my round trip time to half an hour, and I wasn’t even riding quickly. Riding a bike is also fun and reduces the stress of a typical college student’s busy day. 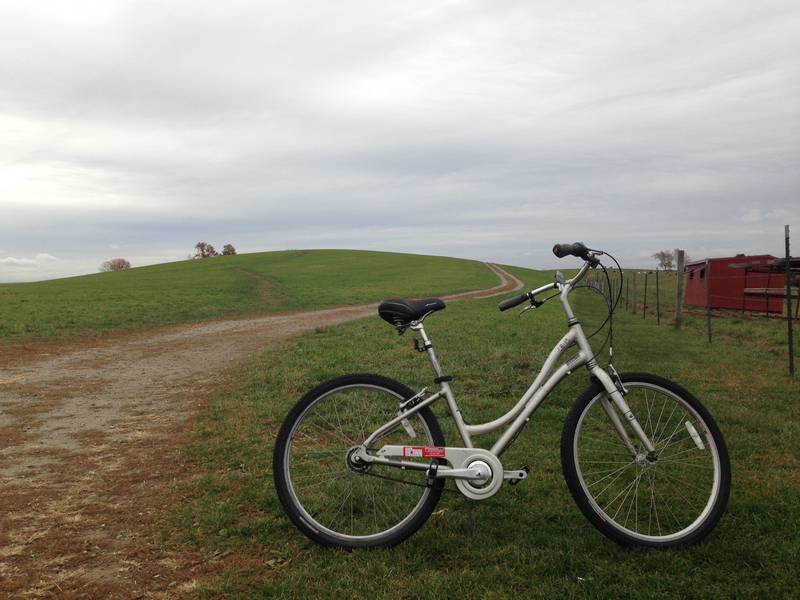 In between my classes one morning, I decided to get some fresh air by riding to one of my favorite places on campus, the top of Horsebarn Hill. My bike was able to tackle the terrain with minimal effort, and I was able to enjoy the beautiful views of the fall colors. 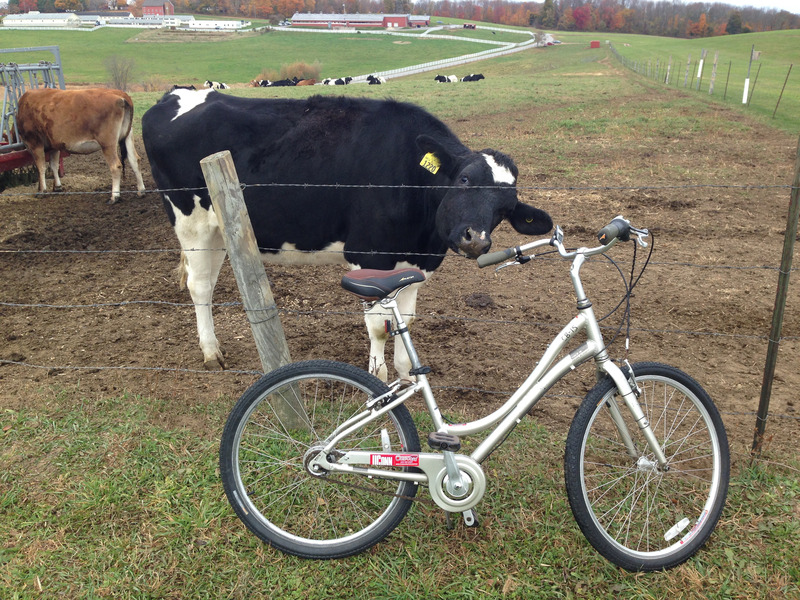 I even had time to tell my cow friend, Lia, about UConn Cycle Share! Now, what about the bike itself? How did it perform? The bike’s functionality is superb, and it was clearly designed with the busy commuter in mind. The seat has several inches of cushioning, and is leaps and bounds more comfortable than my $1500 mountain bike’s seat. The handlebars offer additional comfort as they slope back towards the rider. This allows the rider to sit upright and prevents them from having to lean forward and hunch over. Additionally, on the rear wheel, this bike has something called an internal hub that allows for super smooth shifting. The final noteworthy feature is a chain guard that gives you great peace of mind. Trust me; a chain guard is essential, especially when you’re wearing pants. I was once riding my mountain bike on campus, and my pants got caught in the chain. The next thing I knew I was walking to class with my pants ripped all the way from the cuff to the middle of my thigh! Ultimately, my experience was overwhelmingly positive. I thoroughly enjoyed my week with the bike, and I highly recommend this program to anyone. The process of reserving a bike is simple and straightforward, and the bikes perform very well. Furthermore, it’s a great green alternative to riding the bus and is much quicker than walking. If there is enough demand for bikes, this fantastic program may expand, so please share this with your friends and consider taking a bike out for yourself! It’s officially November, which means that EcoMadness 2015 has come to a close. For the fifth consecutive year, residents of Buckley, East, Northwest, Shippee, Towers, and West competed in a month long energy and water conservation competition to raise awareness of the simple actions we can all take to reduce our electricity and water usage. EcoCaptains volunteered in each residence hall to promote conservation tips and motivate the residents. The outcome of their efforts was outstanding, as this year represented the greatest percent reductions in both water and energy that we have seen in 5 years. We have also witnessed a downward trend in per capita usage of water and energy over the years. Congratulations to this year’s winners, who will be awarded Dairy Bar ice cream parties in the upcoming weeks! Thank you to all of the EcoCaptains and participants for your excellent efforts to conserve water and energy, and raise awareness of this important issue.